Where should I start? I think first a thank you to Donald James MacPhee for yet another excellent walk! Then a ‘warning’ for the other walk leaders: You've got something to beat now if you want to better this walk, DJ set the bar quite high. Or in other words: The WalkIslay 2007 Islay Walking Week is well under way. It started with a great walk in very nice warm and sunny weather. We met at Ballygrant Kennels, I think approx 25-30 people participating in this walk. After a quick introduction (and quite a few ‘nice to see you again’ by the regulars) we set off to Loch Ballygrant, soon followed by Loch Allan and the Lily Loch. The view from Leonie's Seat wasn't as good as we had hoped as it was quite hazy, but it was still very nice up there. 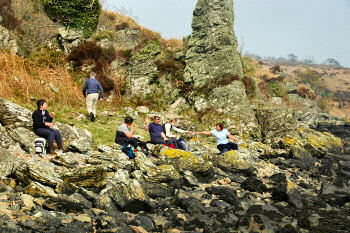 Dropping down to the Sound of Islay we had our lunch close to the shore in a sheltered cove. Then the wildlife, we saw quite a lot: Two buzzards nests, one with a buzzard. A number of seals. A few swans and a swans nest with a huge egg. I think someone saw an adder, although I missed out on that one. A lizard. An eagle's nest and later on the corresponding Golden Eagle, majestically gliding over a glen and then the Sound of Islay. 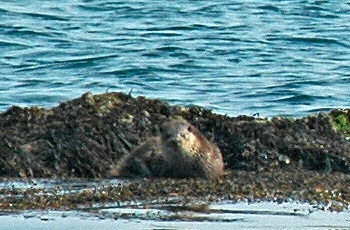 Oh, and that little fella in the picture: An otter. A wee bit too far away for high quality pictures, but the one above still gives a good view. Turning back inlands we started the return leg, passing Lossit Farm (more of that in another entry, there's more cat content waiting for you) and Loch Lossit on the way. After a good six hours walk (with plenty of breaks to admire views, watch wildlife etc) we arrived back at Ballygrant Kennels, where we enjoyed home made pancakes, a cup of tea or coffee and a wee dram of Ardbeg. 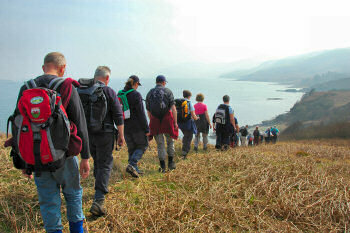 What more could you want from a walk on Islay?